At least my dexterity had improved enough for me to suction the plugs from my mouth myself. 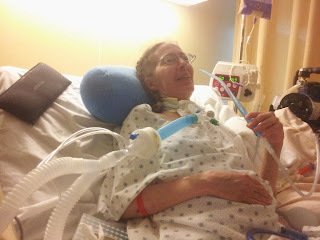 After all of the dramas I had suffered in my struggle to speak, you would think I had finally come to the end of my speech travails when Keith bought me a replacement for the talking and eating valve--aka Passy-Muir valve--which had been carelessly thrown away with my used trach. Within a week or so after the replacement speaking valve was put in, I came down with pneumonia. Not just any pneumonia, but the dreaded MRSA--Methicillin-resistant Staphylococcus aureus. That meant that I was Typhoid Stephanie. All visitors had to dawn sterile gowns and masks before seeing me. The balloon was there for my physical therapy. into my room to give me the limited therapy they could provide there. I had to leave the nursing home at the end of the next month or lose my Kaiser coverage, and I still couldn't walk. The clock was ticking. But that was far from all. The phlegm from the pneumonia was forming into thick plugs, which clogged my breathing tube. Trachs make it harder for you to cough up phlegm.Thus, it was actually impairing my ability to breathe. The irony is that it was becoming increasingly clear that I didn't need the trach anymore (a fact Ricardo admitted when he finally removed my trach a month later). But I wasn't about to give up my hard-won ability to talk. I had already grown to trust Joseph, who prided himself on how many patients he had talked through breathing crises. Being a skeptic, I initially doubted his self-assessment until I saw it for myself (and with myself). He calmly talked me through more than one such crisis, as he did with Vilma, the fellow coma survivor I shared my room with. And speaking of irritation, Joseph spent his entire shift shuttling back to my bed to suction me yet again. All day, I continually hacked as deeply as I could to bring up the plugs. Sometimes they would shoot out of my mouth like spitballs. We should've set up targets. As much as I could, I tried to clear them myself by coughing and by suctioning my mouth and upper throat with a long plastic wand (see above photo). I hated having my trach suctioned because it was uncomfortable and little scary--it felt like the RT was sucking my breath away. It was a bit like being waterboarded, actually, though the only thing they're trying to extract from me was phlegm. Joseph was reluctant to suction the trach too often because of the increasing throat abrasion. He therefore encouraged me to cough them up myself when I could. My chest was beginning to feel like my ribs were boring their way through the skin. I was physically spent, yet every time I started to have trouble breathing, I had no choice but to begin hocking yet again. 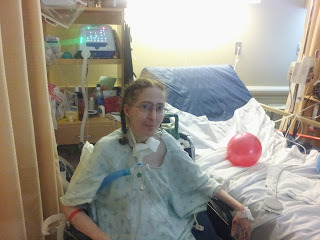 At one point, even suctioning couldn't seem to clear my trach. I coughed and I coughed and I coughed some more until I was hyperventilating so much even the ventilator couldn't keep up. What's worse, since my awakening I had been plagued with frequent bouts of painful chest spasms, which coughing often triggered.Whenever my chest spasmed, my hyperventilation worsened. Now I was scared. And the more nervous I got, the worse the hyperventilation became. Joseph had told me of a heartbreaking case in which he couldn't calm a panicked patient, who eventually died. I wasn't panicking...yet. Still, the story was meant to illustrate the very real dangers of a breathing crisis. But Joseph's soothing manner relaxed me. I focused on imagining a particularly peaceful scene with Keith at an ancient Greek ruin Sicily. As I calmed down, my breathing became more regular. With a several forceful coughs, I expelled the plug restricting my airway. At the end of the day, with my last bit of physical reserves spent, I gave in and allowed them to remove my speaking valve before I went to bed. *The Passy-Muir people tell me that the plug problem could've been solved if the nursing home had only humidified the ventilator air. That makes sense. I'll get into that subject in my next installment of this SfMCR series. Here is Part One, Part Two, Part Three, and a related SfMCR: Gaining the Power of the Pen.